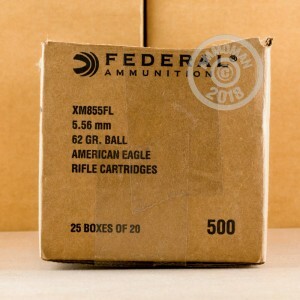 This 500 round case of 5.56 Nato M855 ball ammo is made by Federal and loaded at the famed Lake City plant in Independence, Missourie. 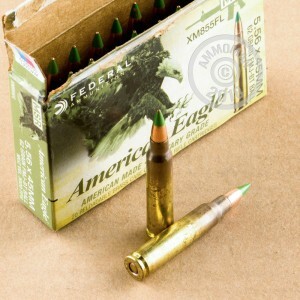 This green tip round is what US troops commonly use which features a 62 gr penetrator bullet. These rounds, which use non-corrosive Boxer primers and reloadable brass cases, make a great range load for your AR-15 and may work in other .223 Remington firearms, depending on the manufacturer specifications. 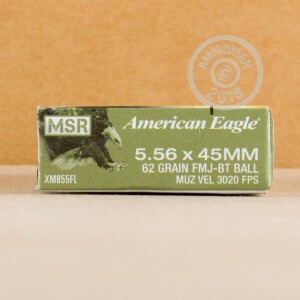 Pick up this 500 round case for a great deal on mil-spec ammo! AmmoMan.com covers the cost of shipping and handling for all orders over $99. You pay only the list price, with no hidden fees lying in wait at checkout.